I'm fat and I'm an athlete. You shouldn't be surprised. It's race day and after flying from Vancouver to San Francisco to run my first half-marathon, I am already tired from the anticipation. I get up at 6:00 a.m., brush my teeth and, with insane nervousness, lace up my shoes. I hail a cab to Golden Gate Park where they are hosting the 30th anniversary 5K and Half-Marathon Race. When I arrive, I feel the excitement immediately; there is a buzz of race anticipation coming from the crowd, loud talking and laughter as thousands of people move towards the big archway that marks the start and gateway to what will be one the most physically challenging days of my life. A calm comes over me and the little voice inside my head says on repeat: "You can do this, you can do this." I start buying it. I inch closer, towards the long rows of tables bustling with volunteers and runners. I find a young man behind the table who's handing out race packages. It's this moment that may seem subtle but speaks volumes about where our societal compass sits when it comes to the perception of larger bodies and fitness. I give him my name and he repeats it under his breath. He looks up at me, and instantly reaches for the 5km race packages, making the assumption, without asking, that I am participating in the shorter distance. The representation of my body size communicates to him an unspoken message that I am not physically capable of running the event's longer distance. If this were an isolated incident, this article wouldn't exist. However, it happens at every event I am a part of and that others like me participate in. It might be an out of line comment, a surprised reaction or the articulation of an assumption about what my body is capable of. More commonly comes the perplexed look of confusion when I tell people I am a personal trainer and I own a fitness business. The well intentioned "good for you" calls echoing from the sidelines in a tone championing a toddler in potty training further stand to signify that people consider my participation an anomaly. I correct this young man immediately. "I am here to run the half-marathon," I say sharply. With surprise and embarrassment he says, "Oh! ", and quickly fumbles for my race package in the other box. I take my number and the event branded race shirt that is three sizes too small, and walk over to my husband and stand off to the side. My excitement and the little voice cheering me on have dissipated. We stand silently waiting for the race to begin. I can't help feeling defeated in that moment -- like an impostor or someone who didn't just train for months and for hundreds of miles. I try to remain positive, as I know this is an integral part of a successful race. Truthfully, I don't blame the young man for taking the visual cue of my body and neatly categorising me with the 5k'ers (which is also a very respectable distance, by the way). Why would he believe that my plus-size body is capable of running 21 long kilometres when there aren't any visual cues presented in society to tell us this is possible? There are no plus-size athletes adorning the glossy pages of magazines, very few fitness books speak on this subject, and in movies fat people are commonly portrayed as dorky and comedic, not strong and capable. Seldom in advertising do we see products and services aligning themselves with body diversity. In fact, the only visual cues we receive that include plus-size representation in workout gear are generally the "before" pictures in weight loss or gym advertising. Despite study upon study demonstrating that fit can also be fat, most of society can't see past the media cues that are put in front of us by advertisers. As a result, athletes who fall outside of the athletic "norm" take the brunt of society's assumptions when attending races and working out in gyms. In spite of this, we continue to participate and pioneer a change in public perception. Triathlete Wendy Welsher has felt the judgement too. "It's always intimidating walking into mainstream gyms as a plus-size girl. Everything changed for me after I found my personal trainer, Rossanna. She has pushed me to be an athlete and has only looked at me for my potential, not my size. She has then encouraged me to become a personal trainer so I can now help girls like me." It was when Wendy finally found the appropriate support that her athleticism excelled. Cyclist and runner, Natalie Dzepina, also recalls people pointing at her and laughing during races. "I was called 'Fatso' a few times. I think seeing a fat chick running makes people uncomfortable. Like her place should be on a sofa with a bag of chips. It's never bothered me as long as I'm out running." While these experiences of judgement and discrimination are disappointing, the moral of this story isn't to be a victim, but to raise awareness around size diversity in athleticism. You see, judgement is rampant and this creates insurmountable barriers for the plus-size population who live in a diet culture of "move more, eat less" advice every time they see their physician, turn on the TV or read a magazine. Many of these individuals want to be active, but can't face the vulnerability of putting themselves out there to be judged. When we talk about a worldwide health crisis, this is it. It is not 'obesity' but how we respond to it. 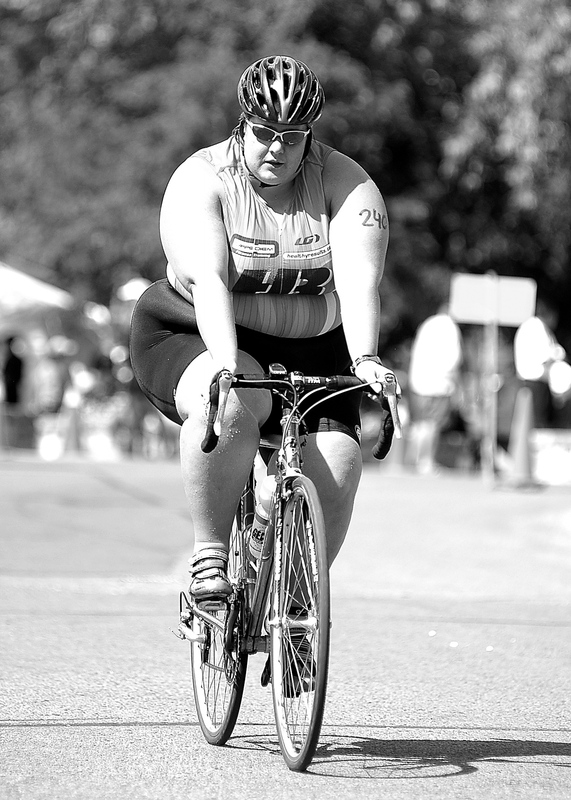 Krista Henderson is a seasoned triathlete and writer of the popular blog dedicated to plus-size athleticism, 'Born To Reign'. She writes, "Healthy and unhealthy bodies come in all shapes and sizes. It's unfortunate the media has created such an unrealistic image of what health looks like, with sculpted bodies and 6-pack abs. The fitness industry is so heavily influenced by the beauty culture." While many people assume that fat automatically equals unfit, there's a growing number of highly respected researchers and agencies that say otherwise. Steven Blair is a renowned exercise researcher at the Arnold School of Public Health at the University of South Carolina. His research shows that excess weight is not "the enemy". Not getting enough exercise and being cardiovascular unfit are much greater contributors to poor health than any extra poundage can be. Blair stands firmly by his research that fit, fat people outlive thin, unfit people. In 2012, The National Cancer Institute also backed this by reporting that physical activity is "associated with greater longevity among persons in all BMI groups: those normal weight, overweight and obese." Another study, published in the European Heart Journal, showed that when obese people are metabolically healthy -- with healthy blood pressure, cholesterol and blood sugar -- they are at no greater risk of dying from heart disease or cancer than those who are of normal weight. Despite the research and increasing numbers of plus-size athletes lacing up, we still see judgement and discrimination even for athletes at an elite level. In the media, emerging stories on plus-size professional athleticism spark a body image controversy. Eighteen-year-old tennis player Taylor Townsend caused a media wave when she beat 21st ranked Alize Cornet and advanced to the third round in the French Open. She is the youngest US female to advance to that level. Yet, three years earlier, in spite of her rising success, the US Tennis Association tried to keep her out of competition at the US Open. It was reported that until she lost weight, they would not support her. Recently, Yahoo Shine published an article about Major League Baseball pro Prince Fielder and the cover he did for ESPN, featuring his naked, powerful, body. If you are not familiar with Fielder, he has played Major League baseball since 2002. He is a five-time All-Star, positioning himself as an elitist among the elite. Yet, to my disappointment, the article's headline read: 'This Male Athlete Is Getting Fat-Shamed'. This negative exposure is disheartening. 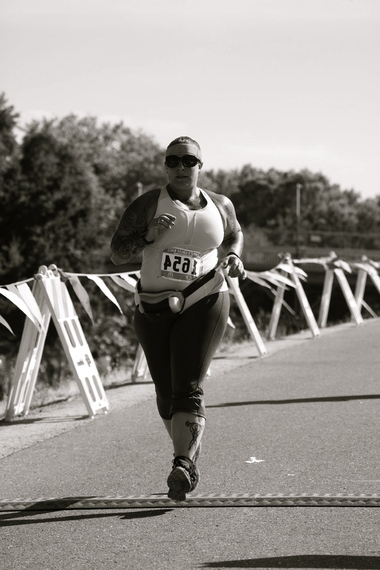 As I, and other plus-sized athletes like me, continue to suit up and show up at races and in the gyms, we must look around and ask why others don't? If elite athletes are the subjects of public-scrutiny despite highly ranking athletic achievement, then what message does that give to the novice who sits on the sidelines hoping to be active one day? People are fearful of fitness and rightly so. We can't harp on people to move their bodies when we live in a society that shames and judges us for our attempts. That day in Golden Gate Park, I ran my heart out. I ran for 2 hours and 51 minutes. I pushed myself towards the finish line, elated in tears that I was going to make it. I wanted to quit but I knew my husband, my biggest supporter, was waiting for me at the finish line. I often think to myself, what if everyone had this kind of support from loved ones or, just as importantly, from strangers? I've gone on to run and cycle many more long-distance races and I never care what people think, anymore. I want to be in the game and inspire others to live their athletic dreams. We are athletes daring greatly to change the landscape of athleticism for everyone, if society will step back, ponder this article, and give us a chance. Louise Green is a globally recognised “fit and fat” voice at the forefront of the Body Advocacy movement. She is a successful plus-size athlete, personal trainer and the Founder of Body Exchange; a fitness platform dedicated to plus-size women. Follow Louise Green on Twitter at @bodyexchange.